Over 30% of the world’s population are iron deficient—that’s about 2 billion people! Fortunately, simply changing your diet or adding the right kind of iron supplement can help balance iron levels and prevent iron deficiency anemia. Iron Fuzion is a new way of approaching Iron Supplements. By utilizing organic, natural iron extracts from the curry tree leaves of India, Iron Fuzion includes the naturally occurring plant cofactors and conutrients that aid in iron absorption and better support your overall health. Not all iron is the same. Plant-based sources of iron are absorbed differently by the body and are optimal for maintaining healthy iron levels. Your body uses plant-based iron more efficiently, and you are far less likely to develop iron toxicity than with iron from animal or synthetic sources. If you are looking for a natural iron source that is both easily absorbed and easily digested, Iron Fuzion is it. Iron Fuzion is smooth and gentle on the stomach and is less likely to cause constipation or diarrhea than traditional iron supplements. One of the most common side effects of low iron is a lack of energy and persistent feelings of fatigue. By empowering your body with a healthy, organic diet and Iron Fuzion, you can begin to feel more energetic. Iron helps form the hemoglobin in your red blood cells. These red blood cells are crucial for delivering oxygen to your lungs and brain. An iron deficiency can impair cognitive function, causing many to experience a feeling of brain fog and sluggishness. Iron Fuzion restores and optimizes this critical oxygen transfer to the brain. With the right balance of iron, you’ll start to feel clear and sharp. A healthy, balanced immune system needs iron to function properly. An iron deficiency can quickly lead to a compromised immune system. Pregnant women are at higher risk for iron deficiency. Frequent blood donation may lead to low iron levels. Iron from plants and animals is absorbed differently. Low iron can cause insomnia. Vitamin C can help increase iron absorption in the body. Why Should I Choose This Iron Supplement? Plant based iron is gentle and easy on the stomach. All-natural; no toxic additives, fillers, colors, or artificial ingredients and sweeteners. Includes organic thyme and echinacea extracts. 1. Am I iron deficient? Signs you're not getting enough iron include constant chills, memory loss, and fatigue. Iron levels in the body have also been shown to affect sleep, the immune system, and cell health, affecting how your hair, skin, and nails look and feel. Prolonged iron deficiency leads to more severe conditions including anemia and organ failure. To be certain about your iron levels you will need to consult your healthcare provider. However, frequent blood donors, women who are pregnant, and women with heavy menstruation are at a higher risk of iron deficiency or anemia. 2. How much iron should I be getting every day? Iron Fuzion contains a conservative serving of 18 mg of iron. That is the Recommended Dietary Allowance for adult women, but your personal requirements may differ. Your diet, age, and health all affect the amount of iron your body requires and can absorb. Remember, too much iron can lead to iron toxicity, and you don't want that either. Only take Iron Fuzion as directed. 3. Will Iron Fuzion cause constipation or upset stomach? Constipation and stomach discomfort is a common side effect of mineral- and meat-derived iron products. Your body absorbs these types of iron differently. For many, plant-derived iron supplements are easy and gentle on the stomach, leading to fewer complaints of constipation and upset stomach. At Global Healing Center, your health and happiness is our number one priority. If you're not satisfied with Iron Fuzion for any reason, then you can return the product for a prompt refund at any time during your first 180 days. If you are experiencing occasional constipation from a synthetic iron supplement, Oxy-Powder® might be able to help. Whether you get iron from your diet or a daily supplement, your gut can influence how much iron your body can absorb and use. Gut health can all play a vital role in iron absorption. Taking a high quality probiotic, like Floratrex™, can help encourage normal nutrient and iron absorption rates. Certain foods and medications can inhibit iron from being properly used and absorbed by your body. Thyroid medications, antibiotics, and antidepressants can all interfere with the effectiveness of iron. Take Iron Fuzion 2 hours before or after taking any medication to help mitigate these effects. Foods that alter iron absorption include coffee, tea, red wine, and chocolate. Never discontinue any prescribed medications without talking to your doctor. Support Your Health With Iron Fuzion Today! 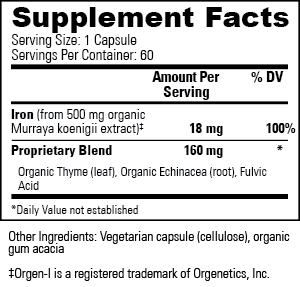 As the primary source of iron for Iron Fuzion, Murraya koenigii provides plant-based iron along with naturally occurring cofactors and conutrients. The Murraya koenigii plant contains vitamins A, B, C, and E, and has been traditionally used to support heart health, fight infections, and as a natural way to add strength and vitality to hair, skin, and nails. Accidental overdose of iron-containing products is a leading cause of fatal poisoning in children under 6. Keep this product out of reach of children in case of accidental overdose call a doctor or poison control center immediately. How long will one bottle of Iron Fuzion last? Can I take too much Iron Fuzion? Does Iron Fuzion cause constipation or upset stomach? Can I take Iron Fuzion with other medications? Can I take Iron Fuzion with other Global Healing Center products? Are all forms of anemia the same? Iron is an essential mineral we all need. However, the exact daily amount depends on the individual. The daily recommended value for most adults is around 18 mg or one serving of Iron Fuzion. Here are the Recommended Dietary Allowances (RDAs) for Iron in the United States. Taking one serving a day, Iron Fuzion will last you 60 days. The exact time will depend on your daily recommended dose of iron. While iron is needed to support critical functions in the body, iron toxicity is a real possibility— especially for children under 6. Take Iron Fuzion responsibly and as directed. Always adhere to suggested use of Global Healing Center products and consult a healthcare provider before altering your personal supplement routine. Because Iron Fuzion uses iron from natural plant extracts, it is far less likely to cause constipation or an upset stomach. Additional cofactor and conutrients from Murraya koenigii, together with a proprietary blend of thyme and echinacea, help support health and soothe discomfort that could occur. If you're not satisfied with Iron Fuzion, you can return it for a prompt refund with our 180-Day Money Back Guarantee. At every step of our testing, manufacturing, and packaging processes we do everything we can to ensure environmentally sustainable practices that are vegan and free from any toxic ingredients or materials. Iron Fuzion is 100% Vegan, GMO-free, and has never been tested on animals. We manufacture all of our product right here in the U.S.A. and never use toxic fillers or any artificial ingredient or sweetener. Some medications have been shown to decrease your body's ability to absorb iron. Always consult your healthcare provider before taking Iron Fuzion with any other prescribed drugs or medications. Global Healing Center offers many natural health supplements that encourage a wide array of healthy body functions. All of our products were created to work in a safe and synergistic way to promote good health. For specific concerns regarding your ability to safely add Iron Fuzion to your daily routine, first consult with your healthcare provider, then contact our customer satisfaction team with any additional questions you may have. Murraya koenigii, better known as the curry tree is an indigenous plant of India. It has been used for centuries to spice different foods throughout the region and is believed by many to hold beneficial health properties. Today, we know that it is a rich source of iron, fiber, and vitamins A, B, C, and E.
There are two major types of iron obtained through your diet or with different supplements—plant- and animal-based. Iron from animal byproducts, also called heme iron, has an aggressive absorption rate. Plant-based iron, also known as nonheme iron, is absorbed at a slower rate. Plant-based iron also has been shown to be gentle on the stomach and shows fewer occurrences of iron toxicity. No, there are different forms of anemia including pernicious anemia and iron-deficiency anemia. Because iron is an essential mineral, Iron-deficiency anemia is caused, prevented, or cured depending on the amount of iron in your blood. Iron Fuzion is an iron supplement with adequate iron amounts to address iron-deficiency anemia in adults who do not have additional health concerns or complications. Before you take Iron Fuzion always consult your trusted healthcare provider first.